Dengue is the most common mosquito-borne viral disease which in the recent years has become a major international public health concern. Globally, 2.5 billion people live in areas where dengue viruses can be transmitted. The geographical spread of both the mosquito vectors and the viruses has led to the global resurgence of epidemic dengue fever and emergence of dengue hemorrhagic fever..
Dengue fever occurs following the bite of an infected mosquito Aedes aegypti. This type of mosquito has a peculiar white spotted body and legs and is easy to recognize even by laymen. It breeds in clean water and has a flight range of only 100 – 200 metres. The mosquito gets the Dengue virus after biting a human being infected with dengue virus. There are four types of dengue viruses that cause dengue fever worldwide. These types are Dengue 1, 2, 3 and 4. The two principal illnesses that dengue virus causes are: dengue fever (an acute illness with fever, headaches, joint pain, muscle pain and rash) and dengue haemorrhagic fever. The infection can become dangerous since it may cause damage to the blood vessels. The damage may range from increased permeability of the blood vessels, causing leakage of blood fluid/plasma into various organs to completely broken blood vessels that causes bleeding. 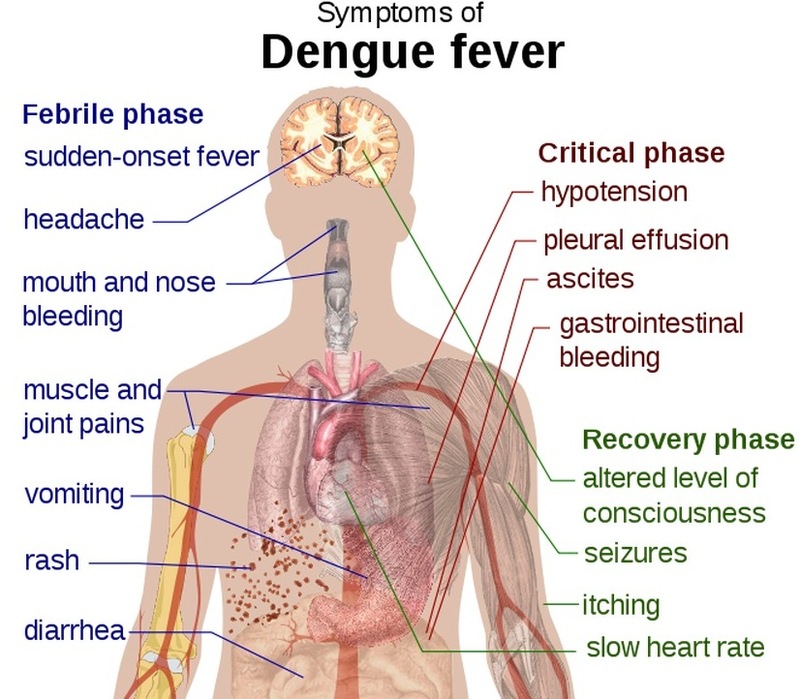 The symptoms and signs of dengue haemorrhagic fever and dengue shock syndrome are related to damage to the blood vessels and derangement in functioning in components of blood that help it to clot. People who suffer from dengue fever have no risk of death but some of them develop Dengue Haemorrhagic Fever or Dengue Shock Syndrome. In some of these cases death can occur. With proper treatment, the patients with Dengue haemorrhagic fever and dengue shock syndrome can recover fully. Good treatment provided in time can save most lives. It is possible to get dengue more than once. Dengue can occur because of 4 different but related strains of dengue virus. If a person has suffered from one virus, there can be a repeat occurrence of dengue if a different strain is involved subsequently. Dengue does not spread directly from person to person. It is only spread through the bite of an infected mosquito.After the entry of the virus in the person, it multiplies in the lymph glands in the body. The symptoms develop when the virus has multiplied in sufficient numbers to cause the symptoms. This happens generally about 4-6 days ( average) after getting infected with the virus. Sudden onset of fever which lasts 3 to 7 seven days. Very painful headache, especially at the back of the eyes. Pain in the joints and muscles such as knee, ankle and elbows. Unpleasant taste in the mouth, sort of metallic. Loss of appetite accompanied by abdominal pain, vomiting and diarrhoea. Rashes on arms and legs, severe itchiness leading to skin peeling off and hair loss. Heavy menstrual periods with minor bleeding from nose or gums. Flushing of skin on face and neck. Second instance of rash as fever subsides. DHF is a complication of the disease that can be fatal. It usually occurs if one has dengue infection more than once. DHF was first recognized in the 1950s during the dengue epidemics in the Philippines and Thailand. By 1970 nine countries had experienced epidemic DHF and now, the number has increased more than fourfold and continues to rise. Today emerging DHF cases are causing increased dengue epidemics in the Americas, and in Asia, where all four dengue viruses are endemic, DHF has become a leading cause of hospitalization and death among children in several countries. The condition of the patient show rapid deterioration 2-5 days after the fever starts. If the disease is not severe, the signs and symptoms decrease after the fever resolves. Patients with severe disease can unexpectedly deteriorate after a few days of fever and develop bleeding from the nose, gums, mouth or in the skin, which leads to purplish bruises. In some of these patients after the fever resolves signs of circulatory failure (low blood pressure or shock) develops which can rapidly progress to severe shock or turn lead to death within 12 to 24 hours. Patients can recover quickly from DHF following appropriate medical treatment. It is possible to get dengue more than once. Dengue can occur because of 4 different but related strains of dengue virus. If a person has suffered from one virus, there can be a repeat occurrence of dengue if a different strain is involved subsequently. Being affected by one strain offers no protection against the others. A person could suffer from dengue more than once in her/his lifetime. The risk of dengue haemorrhagic fever increases if you contract dengue more than once. A patient is advised to visit a medical facility as soon as possible. A patient from DSS can recover, but if not managed immediately, DSS can cause death within 24 hours. There is no vaccine against dengue. Developing a vaccine against dengue has been challenging although there has been recent progress in vaccine development. Like most viral diseases there is no specific treatment for Dengue. Most patients with dengue fever can be treated at home. They should take rest, drink plenty of fluids that are available at home and eat nutritious diet. Whenever available, Oral Rehydration Salt/ORS (commonly used in treating diarrhoea) is preferable. Paracetamol is the drug of choice to bring down fever and relieve joint pain. Other medicines such as Aspirin and Ibuprofen should be avoided because of increased risk of bleeding. Antibiotics are usually not required. Sufficient fluid intake is very important and becomes more important in case Dengue Fever progresses into Dengue Hemorrhagic Fever (DHF) or Dengue shock syndrome (DSS), where loss of body fluid / blood is the most salient feature. It is important to look for danger signs and contact the doctor as soon as any one or more of these are found. Homeopathic treatment has claimed to have come up with suitable formulations for combating the disease successfully. Homeopathic doctors have come up with a particular formulation which has been reasonably successful in combating dengue fever. The formulation reads as cRHUS TOX. / EUPATORIUM PERF. / CHINA OFF. / LEDUM PALUSTRE. / GELSEMIUM. / 5CH. / aã. A patient may carry this formula to a homeopathy pharmacist and the pharmacist should be able to do the rest. Bleeding in dengue is one of the dreaded complications and is associated with higher mortality in dengue hemorrhagic fever (DHF) or Dengue shock syndrome (DSS). Bleeding manifestations are highly variable and do not always correlate with the laboratory abnormalities in the coagulation profile. Factors like mild degree of disseminated intravascular coagulation (DIC), hepatic derangement and thrombocytopenia act synergistically to cause bleeding in dengue patient. Severe bleeding is related to severe thrombocytopenia. Platelet transfusion is given in those patients who is either bleeding or having other haemorrhagic symptoms along with thrombocytopenia. While medical fraternity globally recognizes the role of platelet transfusion in the management of hospitalized dengue patients the exact indications and situations in which these are to be transfused may vary. Most patients with dengue fever can be treated at home. They should take rest, drink plenty of fluids that are available at home and eat nutritious diet. Whenever available, Oral Rehydration Salt/ORS (commonly used in treating diarrhoea) is preferable. Sufficient fluid intake is very important and becomes more important in case DF progresses into DHF or DSS where loss of body fluid / blood is the most salient feature. It is important to look for danger signs and contact the doctor as soon as any one or more of these are found. If the doctor tells you that one of your acquaintances is suffering from Dengue then it is very important for you to understand some things related to the need and availability of blood. When a person is suffering from dengue, his/her platelet count can come down drastically. A normal platelet count in a healthy individual is between 150,000 and 450,000 per µl (microlitre) of blood. If the patient’s platelet count falls below 50,000 per µl then one must prepare to arrange for platelets. Normally the doctor advices platelet transfusion only when platelets count falls below 30,000 per µl. Not all patients suffering from dengue require platelets. One must understand that platelets may not be available off the shelf from most blood banks even if they are collecting hundreds of units per week because of the sheer size of demand. The shelf life of platelets is only 5 days Several blood banks do not have the facility to separate platelets from whole blood. 1 unit of platelets refers to the platelets separated from blood collected from a single donor. This is also referred to as Random Donor Platelets(RDP). There is no blood group for platelets. A person can be given RDP of any group unless the person is a lady in the child bearing age or younger than that. If the doctor advises you to arrange for more than 4 units of platelets at once, then you could opt for a process of collecting only platelets from the donor. This is called Single Donor Platelet(SDP) or apheresis platelet. A healthy male weighing more than 60 kgs and who fulfils other criteria for blood donation is an eligilble platelets donor. Platelets donation is absolutely safe for the donor and it ensures that the patient receives good quantity of platelets with minimum risk of transfusion transmitted infection. If platelets are not available in the blood banks, a volunteer of Sankalp will try to help you find them. It is strongly suggested that you maintain clear communication and follow the suggestions that the volunteer makes in order to ensure that you get platelets in the fastest possible manner. The volunteer is trained to guide you to make the best use of all available resources to find the unit of platelets successfully. Try to organise for blood donation as early as possible to ensure supply. Search for blood in blood banks if you can’t arrange by yourself. Take help of blood helpline: 9480044444. In case you still do not find platelets, take help of Sankalp’s Emergency Team. Coming to the financial aspect, each unit of platelet(RDP) costs between Rs.300 - Rs.800/- in most blood banks. One may require upto 8-10 units of platelets for each patient. The cost of SDP is anywhere between Rs.8,000 - Rs.12,000/-. It is wise to adequately provision for this and in many cases this cost may not be covered by insurance. There are several blood centres who organise SDP. If you wish to know the blood centres in your vicinity, please call 9480044444. Preventing mosquitoes from accessing egg-laying habitats by environmental management and modification. 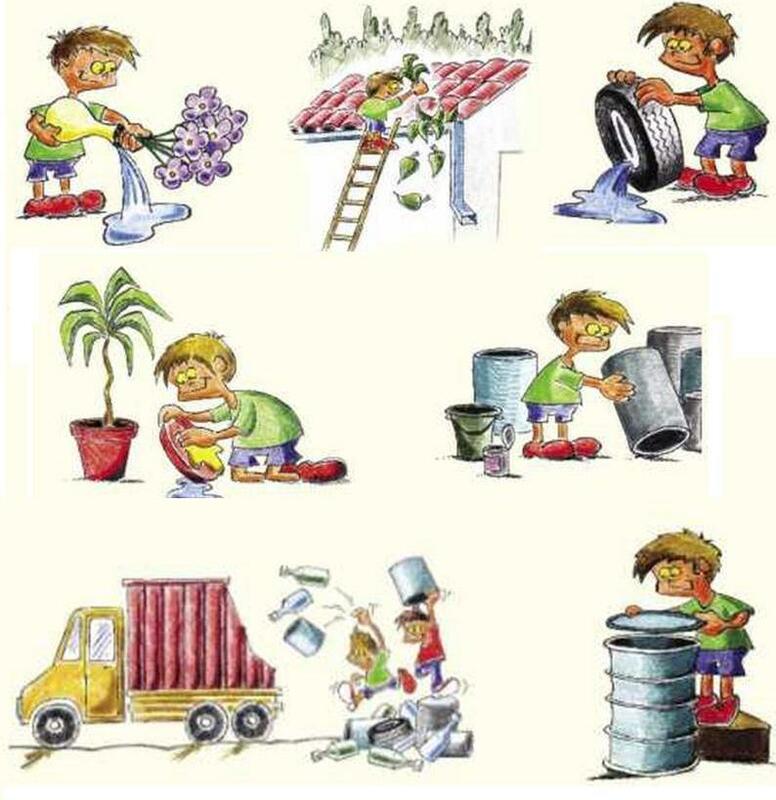 Disposing of solid waste properly and removing artificial man-made habitats, like plastic containers, drums, buckets, or used automobile tires. Covering, emptying and cleaning of domestic water storage containers on a weekly basis. Applying appropriate insecticides to water storage outdoor containers. Using of personal household protection such as window screens, long-sleeved clothes, insecticide treated materials, coils and vaporizers. Improving community participation and mobilsation for sustained vector control.